Like The Beach Boys' Smile and Duke Nukem Forever before it, the US version of Spotify has been elevated to a sort of mythological status by collective anticipation. Music nerds and tech geeks all over this fine nation of ours have waited with bated breath for the service to work out all of its licensing kinks and finally make its way to our shores. In an interview earlier this week, a Spotify higher-up promised us that the service will be pretty much the same as the one that Europe has already come to love -- the question, then, is whether or not disappointment is inevitable after so much waiting. Spotify gave us the opportunity to take the premium desktop and mobile versions of the service for a spin. Check out the result below. After signing up, we felt an immediate pang of disappointment at the lack of a web-based client, along the lines of what Rhapsody offers. There's a lot to be said for the ability to sign in across different machines from the convenience of a browser. That said, the company will likely have most users' regular listening habits covered, between the downloadable desktop client and mobile version (iOS and Android apps have already been announced for the US), which are all part of the $9.99 version were given access to. The desktop version feels surprisingly lightweight, compared to many of the bloated music apps we've seen over the years. Layout-wise, it should prove quite familiar to anyone who's used iTunes for any amount of time, right down to the use of eighth note symbols in the left navigation bar. When you log in for the first time, Spotify offers up a page of new release in the center -- once you've connected with friends via Facebook, a feed of their listening updates will appear below this section. The left bar lets you toggle between the aforementioned What's New page, your music queue, a message inbox, and a list of your devices. Below that are buttons for your library, local files (stuff stored on your computer), tracks you've starred, music in your iTunes library, and playlists you've created on Spotify. The bottom of the bar is reserved for the artwork associated with your current song. The right bar features a list of people you've connect with via Facebook, though you can toggle this off when you're sick of looking at their beautiful faces. The controls for the service, including play, pause, forward, back, and volume are along the bottom, together with a music status bar and options for shuffling and repeat. The top bar offers a link to your profile, where you can log in and out, arrows for navigating through the service's pages, and a search bar that pull results from Spotify's massive selection and your own PC library. Spotify's results will appear on the top, including matching artists and album. Below this, you'll find results computer's library. The desktop client does a really terrific job bringing music from both sides into a single location -- in fact, we can see mostly ditching iTunes on the desktop for regular usage, seeing as how the thing even imports the playlists you've created with that application. The minute you log in to the client, it will begin searching for tracks on your computer. If you find a song or album you like in Spotify's collection, you can make it easily accessible by starring it, listing it in the left nav along with your more permanent collection. Songs are also easily dragged and dropped into playlists. Tracks you're particularly fond of can be dragged and dropped onto a friend in your list, along with a personal message. Right clicking a song also makes it possible to share it in your Twitter or Facebook streams -- it's not quite the social functionality of an Rdio, but it's a great option to have nonetheless. The mobile app, not surprisingly, is less feature rich, though there's plenty of good stuff in the iPhone version we checked out. Logging in brings you to a page that's more or less analogous to the desktop version's left nav, featuring starred songs, your inbox, local tracks, iTunes, and playlists. We found that the playlists loaded almost immediately -- starred tracks, on the other hand, took a lot longer to appear, for whatever reason. Spotify mobile's iTunes feature is a fairly killer app, letting you access and play songs that you've saved on your desktop. The first time you log in to the desktop client, Spotify cross checks your library with its own selection, making it possible to stream songs from its catalog and saving you the hassle of having to upload your collection to a music locker (*cough* Google Music). 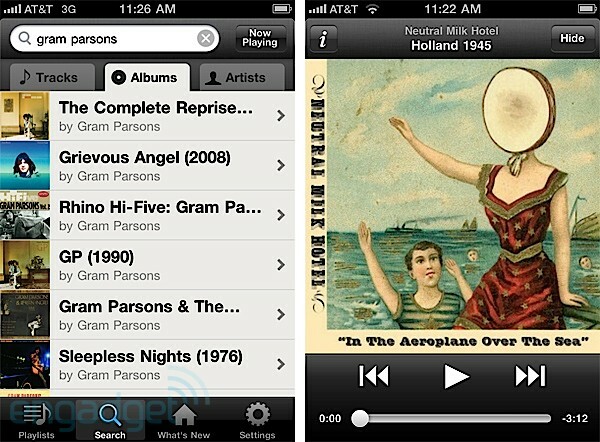 The Android version of the app has similar functionality, though it relies on a Library button on its home page, rather than referencing iTunes. Also excellent here is the inclusion of offline caching on both the desktop and mobile versions, making it possible to listen to music when your internet connection isn't so hot. All of this adds up to a truly terrific and fully realized music service. It's not lightyears ahead of the rest as some have suggested, particularly given the increased competition from cloud-based services by the likes of Google, Apple, and Amazon, but Spotify is in a fantastic position to become a true contender in US music software scene. 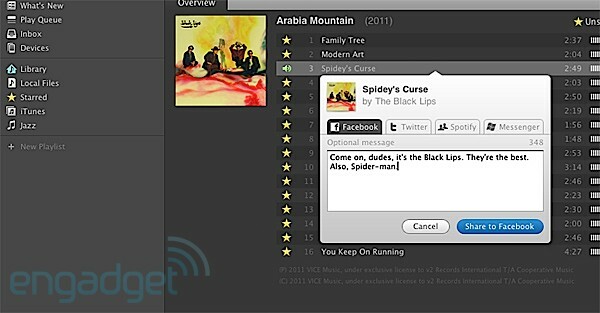 It's slick, it has solid mobile apps, and boasts a great selection of songs. Yep, as it turns out it was worth the wait.